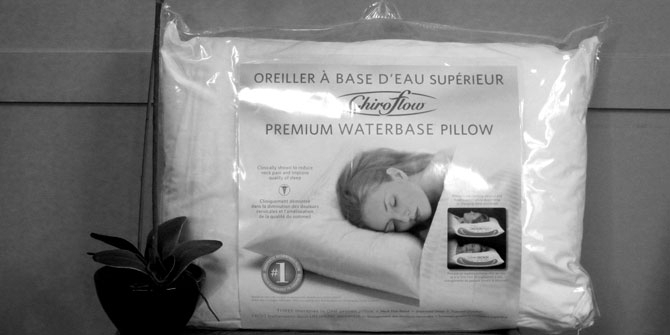 Benefit Chiropractic & Wellness in Langley BC is a supplier of Chiroflow Pillows. Chiroflow Pillows are water-based pillows that provide both luxurious comfort, as well as great support for the head and neck while you are sleeping. They are designed with a thick comforable hypoallergenic cushion that sits over the water base. They are easy to fill, and have shown in clinical trials to reduce neck pain and improve the quality of sleep. One advantage to these pillows is that you can customize them to fit your body by altering the amount of water in the pillow. This allows you to adjust the thickness of the pillow to accommodate the needs of your neck and head. The other advantage to this pillow is that because there is water supporting your head, it is able to adapt and gently respond to changing sleep positions. The water will cradle and support the neck and head as you roll over and change postions through the night. If upon waking you experience neck pain and stiffness, shoulder discomfort, or headaches, it may be time to change your pillow. More information on the Chiroflow pillows can be found at www.chiroflow.com.